The Eden Raised Garden Bed 4ft x 4ft x 5.5in is a great addition to any garden or landscape. The Eden line of raised garden beds in a functional alternative to in ground gardens. Constructed from solid fir wood (which is rot resistant), easily assembled with no tools needed, takes an average of a few minutes to assemble. The custom design allows for a solid raised garden bed with minimal efforts and again no tools needed. Standing at 5.5 inch tall, this design allows for deep rooted plants and perennials and is easily expandable by adding another Eden Raised Garden Bed right on top through our unique locking design. The design allows for multiple layers to be added as your garden needs change. An easy introduction to raised bed gardening. This raised bed is the perfect place to start developing your skills and experience the joys of growing your own vegetables. With 16 square feet of available planting area there is room to grow a good assortment of your favorite veggies, herbs or flowers. Tool-free snap-lock joints make it simple to install.As your garden needs and expertise grow you can add on to your modular raised bed any time by purchasing additional 2 inch tool-free kits, boards or stacking brackets to stack or extend your garden. Curved 2 inch boards are also available to incorporate into your design.Your kit comes with everything you need except the soil and plants. Each modular kit includes four of our 2 inch Classic Sienna composite boards, and four 2 inch snap-lock stacking brackets. The insulating open-channel boards trap air, providing insulation to your soil. Keeps soil warmer in the Spring and Fall, and cooler in the Summer, so you can grow for an extended period. Maximum options in a minimum of space. The deep 11-inch section is great for growing tall veggies or flowers that need strong root systems (like tomatoes), and equally useful for root vegetables like carrots or garlic that need depth to develop freely. The 5.5-inch section works perfectly as an herb garden. This garden gives you plenty of space and options to grow a complete salsa or spaghetti sauce garden. Grow an amazing Berry Garden, with blueberries, raspberries or currents planted in the top level, and strawberries planted below. Tool-free snap-lock joints make it simple to install.Your kit comes with everything you need except the soil and plants. Each modular kit includes ten of our 2 inch Classic Sienna straight composite boards, six 2 inch snap-lock anchor brackets and four of our 2 inch snap-lock stacking brackets. The insulating open-channel boards trap air, providing insulation to your soil. Ooh-la-la! Bring a French flair to your garden with this elegant showstopper made possible with our revolutionary curved composite boards. With three levels and nine separate planting sections you will never run out of options for unique planting combinations. Feeling traditional? Plant a sculptural boxwood in the top section, fragrant lavender in the mid-section and shrub roses in each of the four lower petals. Feel free to mix it up with colorful annuals, or create a unique berry garden, with blueberries, raspberries and strawberries. Stunning from every angle, this garden bed deserves to be the focal point of your yard or garden. It also makes a beautiful commemorative garden to celebrate an event or honor a loved one. Tool-free snap-lock joints make it simple to install. 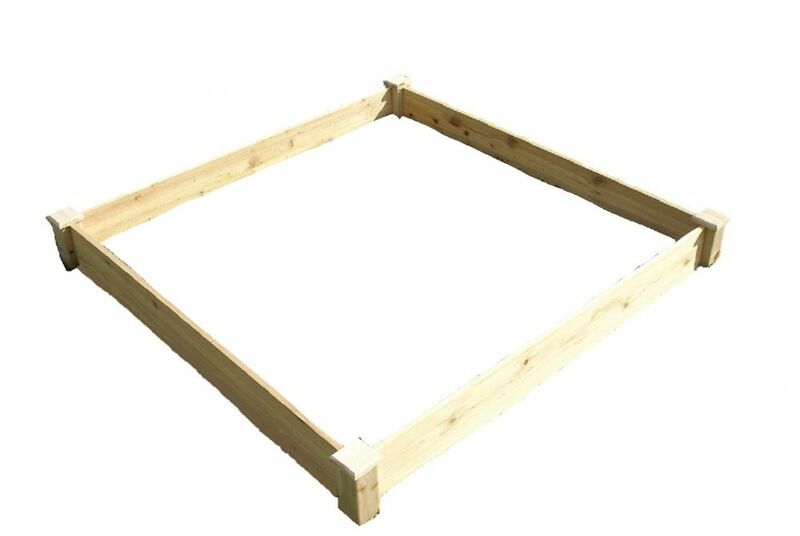 Quick Assembly Raised Garden Bed (4 ft. X 4 ft. X 5.5 inch) The Eden Raised Garden Bed 4ft x 4ft x 5.5in is a great addition to any garden or landscape. The Eden line of raised garden beds in a functional alternative to in ground gardens. Constructed from solid fir wood (which is rot resistant), easily assembled with no tools needed, takes an average of a few minutes to assemble. The custom design allows for a solid raised garden bed with minimal efforts and again no tools needed. Standing at 5.5 inch tall, this design allows for deep rooted plants and perennials and is easily expandable by adding another Eden Raised Garden Bed right on top through our unique locking design. The design allows for multiple layers to be added as your garden needs change.